If you follow Food and DIY on Instagram you’ve already seen a quick peek at today’s recipe. 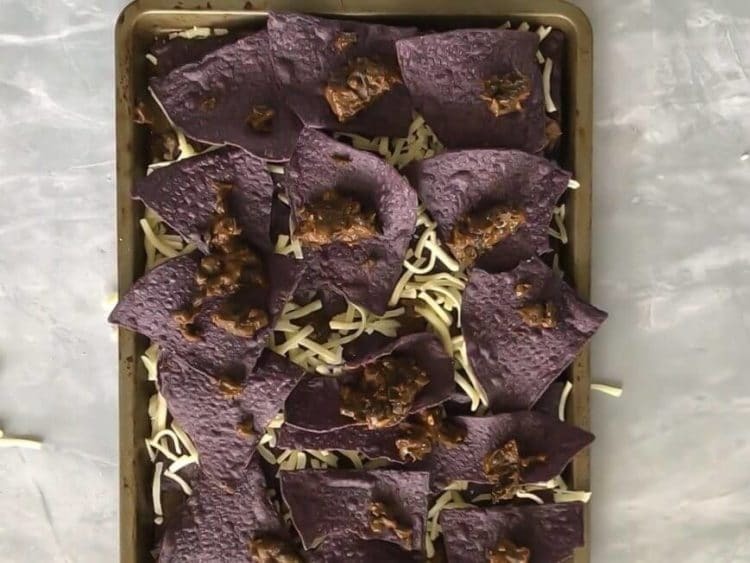 Baked Black Bean Nachos. 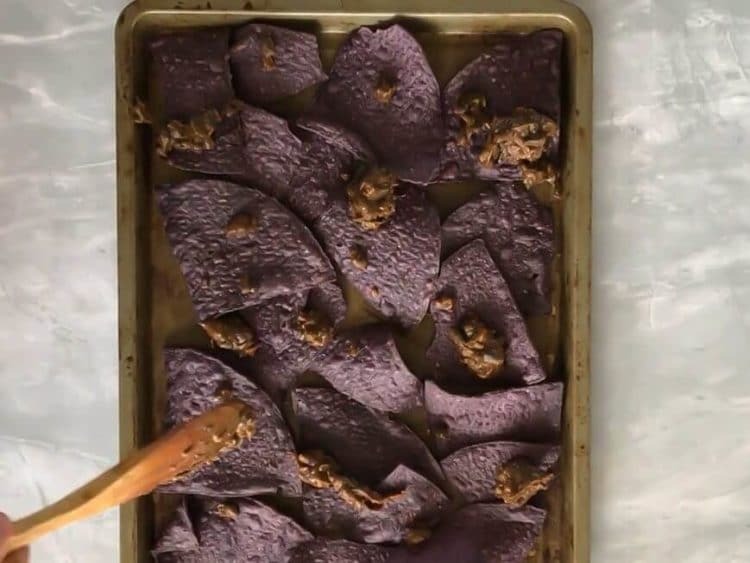 These nachos are seriously so delicious and EASY to make. You can either watch the video below for the recipe or keep scrolling for the step by step photos. 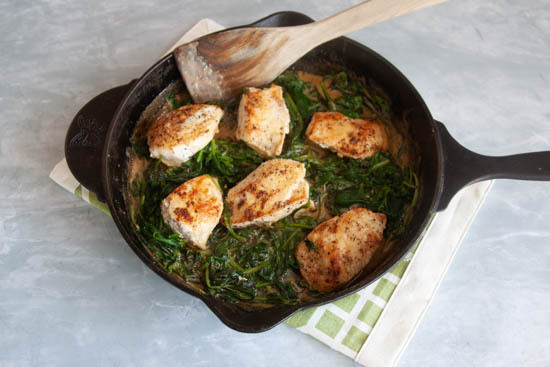 I hope that you enjoy this recipe as much as my family does! 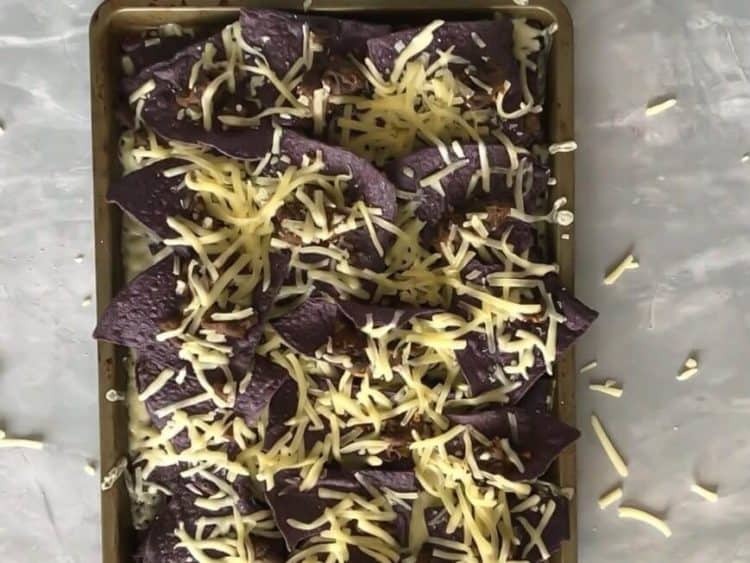 My kids love these nachos and it is a fairly simple recipe to whip up. Bonus, it’s a meat-free recipe so it’s pretty inexpensive to make as well! First of all, preheat your oven to 350 degrees. Then you need to heat your skillet/frypan/what have you. Drizzle in about 1 tbsp cooking oil. Add one 14.5 oz can black beans, drained & rinsed. Add a spoonful of minced garlic. Or you can mince your own garlic and add that. I’m lazy. Mix the beans and garlic up, letting the beans heat through. 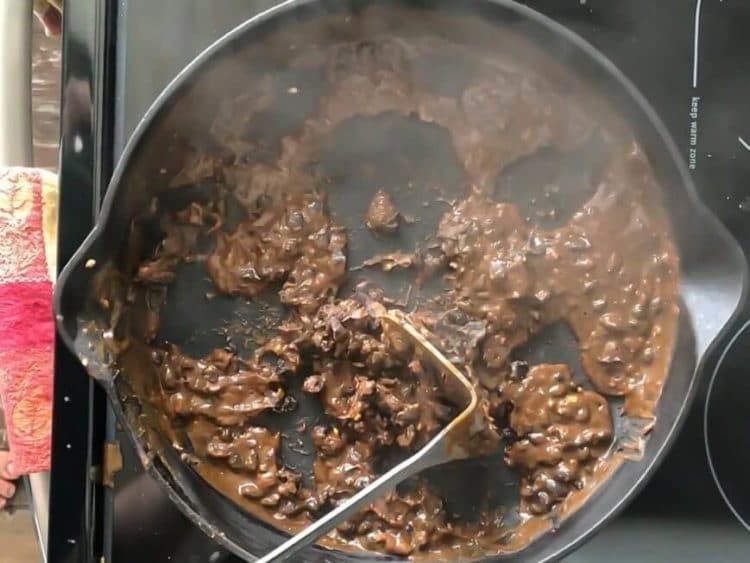 Then you are going to get a heaping spoonful of adobo paste, mix it around (adobo paste if very thick FYI), add in about a cup of water, and just keep mixing everything around. With the heat and water, the adobo paste will eventually thin out. After the paste thins out, and then everything starts getting thick again, use a potato masher to mash those beans up! 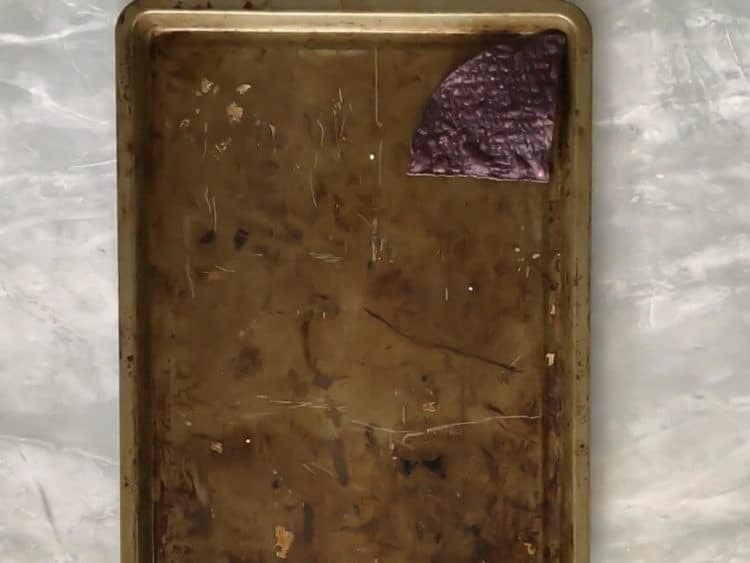 Now, get a baking sheet and cover it with one layer of blue corn chips. 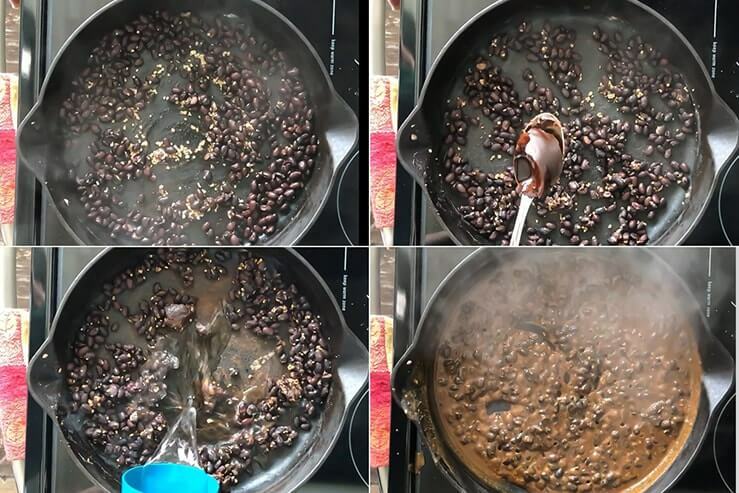 Evenly drop the refried black beans onto the chips, you may need to add a bit of water back to the beans for them to be thin enough to do this step. Sprinkle half the Monterey jack cheese over the beans/chips. Then repeat the three layers, chips, beans, cheese. 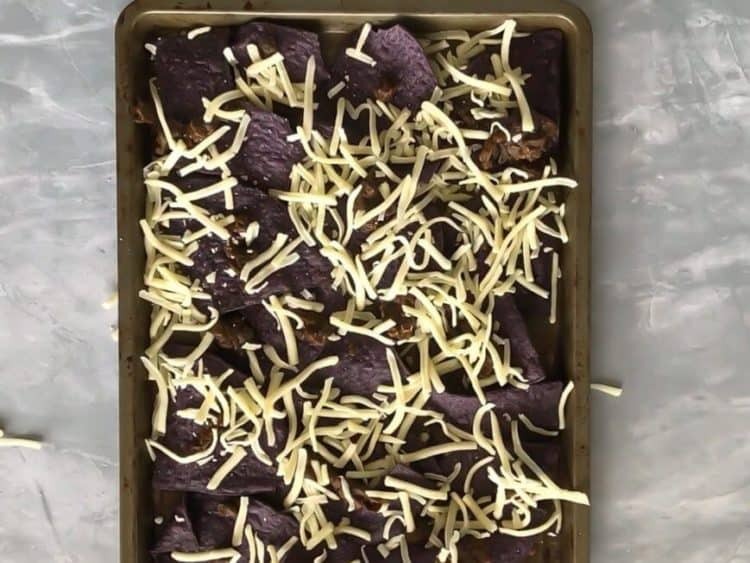 Now, pop your baking sheet full of yummy goodness in the oven for 5-10 minutes until the cheese is all nice and melty. When the cheese is all nice and melty (I could have left my nachos in the oven a few more minutes but I had very hungry kids), remove the sheet from the oven and add pico de gallo. 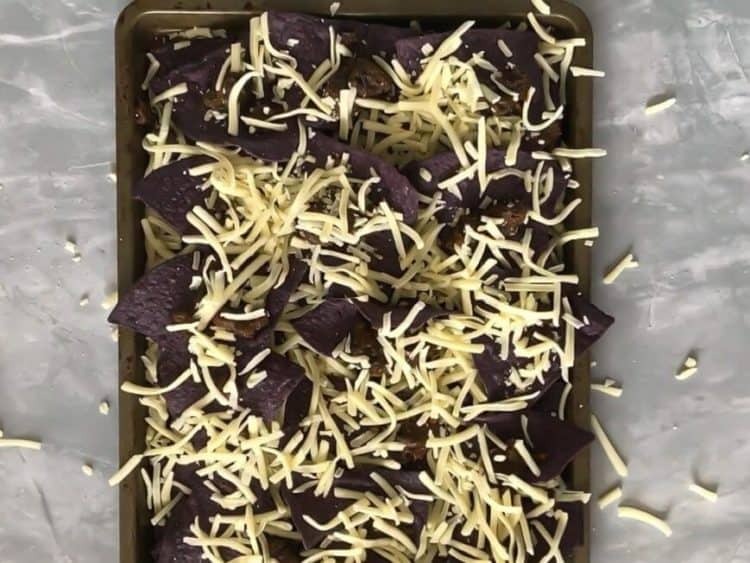 What is your favorite kind of nachos? Leave me a comment below ↓ and tell me. 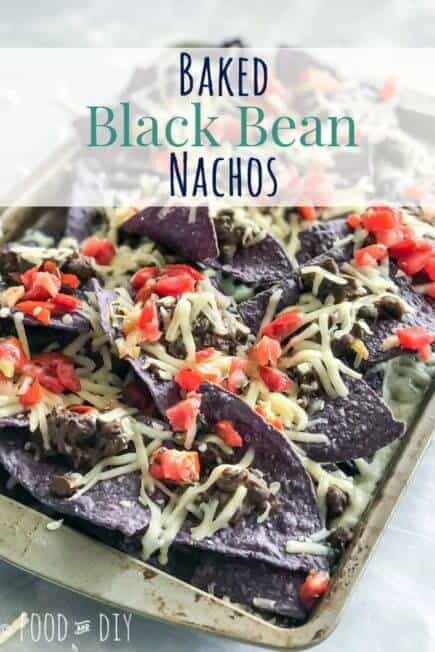 Baked Black Bean Nachos. Layers of crisp blue corn chips, Monterey Jack cheese, refried black beans, and topped with pico de gallo. Delicious. When heated through, add adobo paste & about 1 cup of water. The heat and water will eventually thin out the adobo paste, you will have to stir and work it in a lot. Once the adobo paste has thinned out, use a potato masher to mash the beans. 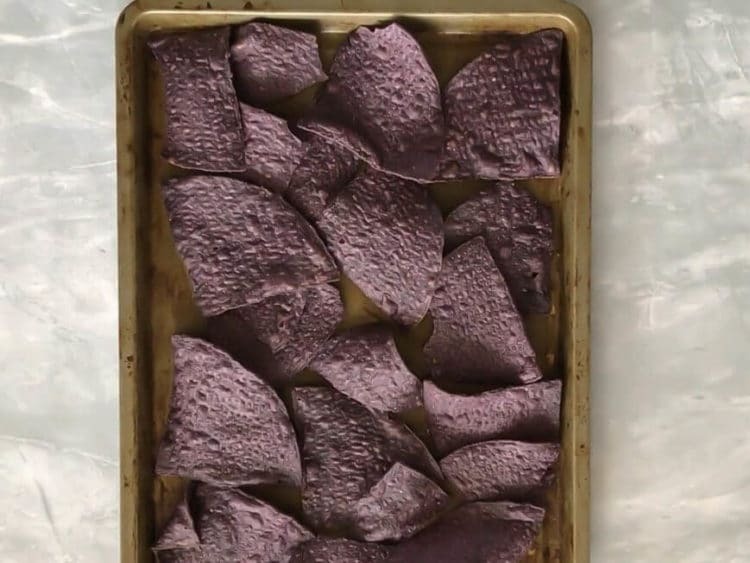 Layer about half the bag of blue corn chips in a single layer on a baking sheet. 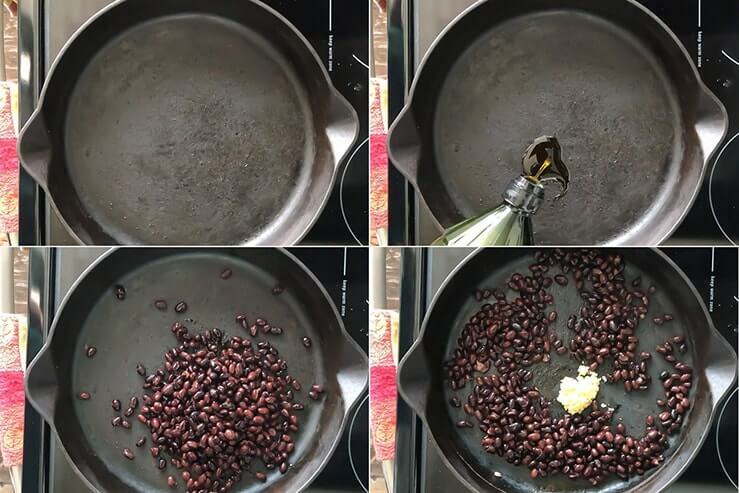 Drop spoonfuls of the refried black beans, you may need to add a bit of water to the beans to thin them back out. Sprinkle half the cheese over the beans/chips. Repeat your layers! Chips, beans, cheese. 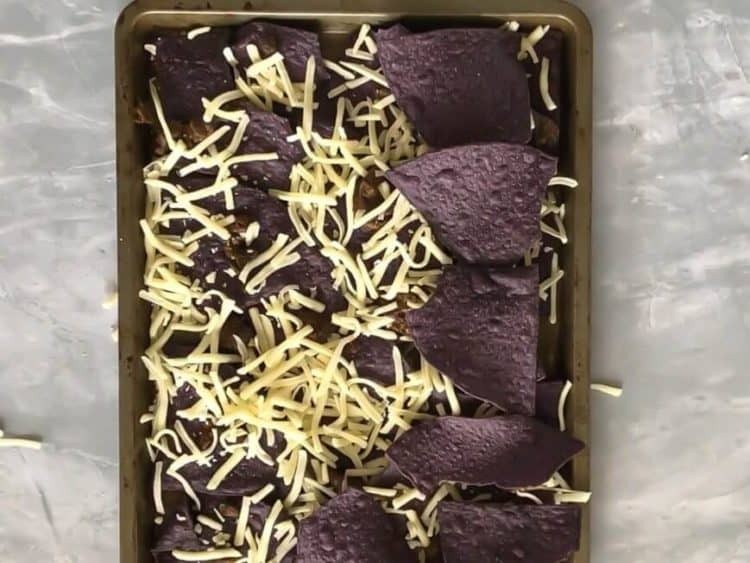 Bake the nachos for 5-10 minutes until the cheese is nice and melty. Remove from oven, add pico de gallo. Serve immediately, unfortunately these do not save well at all. Hi Anna! Your Baked Black Bean Nachos look and sound deeee-licious! 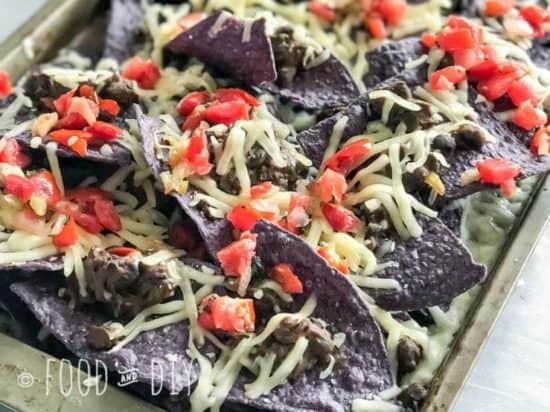 I love nachos any way, shape or form, so this recipe is right up my alley! 🙂 Great step-by-step photos too! Hey Alia!! So glad you stopped by! Nachos definitely are great just about any way! 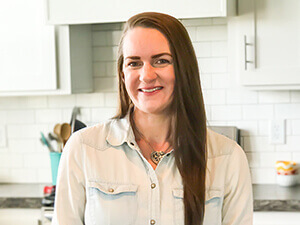 🙂 I hope you enjoy this recipe if you try it! !